Through repeated prayers offered in preparation of this message, I have had one objective: that I be led to communicate truths that would significantly help each of you find happiness. I recognize that the great majority I address are faithful sons and daughters of Father in Heaven who strive to obey his commandments—or sincere individuals who want to do so. For that reason I would speak to each of you as though we were in a private conversation where we share our purest feelings, our aspirations, our hopes, and our dreams as two can do when there is mutual trust and a common basis of belief. I encourage you to write the feelings and impressions that come to you. I have prayed that the Spirit confirm to your mind and heart the essence of what I would like to communicate. For some time I have known how I wanted to begin this message, yet I have always been very careful not to share sacred experiences without a feeling of authorization to do so. I thought first of merely stating the principles that I learned from one such experience without reference to the specific event. Yet I realized that it would be far more meaningful if I related exactly what occurred. After prayerfully seeking guidance, I feel I can communicate an experience that is sacred to me. It indelibly taught how precious and of inestimable worth is the gospel plan or plan of happiness Heavenly Father has given us. I have seen that plan from a different perspective than ever before in my life, and that has given me greater understanding and appreciation for it. I pray that when we conclude you may feel that same gratitude. May you also resolve to take fuller advantage of the inexpressibly rich opportunities the Lord has given us for true happiness, now and forever. Recently I awoke from a most disturbing dream. I ached physically, was saturated with perspiration, and my heart was pounding. Every sense was sharpened. The transition from sleep to wakefulness was imperceptible. I have come to recognize that as an indication of a significant spiritual experience in a dream. I had been taught lessons that would change my life. Although the actual dream was extensive, the key lessons communicated can be summarized by reference to a few specific experiences in the dream. I thought, that is impossible. I know her, and I know she will never change. As more encounters came I realized that I was surrounded with evil individuals who were completely unhappy, with no purpose save that of frustrating the happiness of others so that they too would become miserable. These wicked ones were striving to manipulate those persons over whom they sought to exercise control. I somehow was conscious that those who believed their lies were being led through treachery and deceit from what they wanted most. They soon began to believe that their individuality, their experience, and their relationships as families and friends were being altered and lost. They became angry, aggressive, and engulfed by feelings of hopelessness. The pressure became more intense to accept as reality that what I had been no longer existed and that my cherished wife was no longer the same. Should I encounter her she wouldn’t recognize me nor want me. I resisted those thoughts with every capacity that I could find. I was determined to find her. I knew that there must be a way and was resolute in searching no matter what the cost in time or effort. It was then that I broke out of that oppressive surrounding and could see that it was an ugly, artificial, contrived environment. So intense were the feelings generated by what I had been told by those bent on destroying my hope to take me captive that I had not realized the forces of opposition that made my efforts appear fruitless could have no power over me unless I yielded through fear or abandonment of my principles. The environment appeared real, yet it had been generated from fear and threat. Although it was simulated, to those who let themselves believe the falsehoods thrust upon them it became reality. I can now understand that because of my faith in the truths of the gospel plan, I could break through Satan’s manipulative, evil environment to see it as it is—not only in the dream, but in real life as well—a confining, controlling, destructive influence that can be overcome by faith in and obedience to truth. Others were disheartened, disoriented, and finally overcome as they lost hope because they either lacked a foundation of truth to engender conviction, courage, and confidence or they let their belief be overcome by the pressure of the moment. As I awoke there flooded over me feelings of love and gratitude for our Heavenly Father and his Beloved Son that I do not have the capacity to express. My heart and mind filled with consuming love for them and inexpressible appreciation for the blessings that are available to every spiritual child of Father in Heaven willing to believe and be obedient to the plan of happiness. I cannot convey the unspeakable joy, the feeling of being wrapped in pure love, the absolute assurance that we will never lose our identity or memory of cherished relationships or the benefits of righteous acts as we continue to resist evil and are obedient to truth. Our Father’s love, his perfections, and his perfect righteousness are absolute guarantees that we will ever exist as an individual entity, an intelligence clothed with spirit and body with latent divine capacities that mature and flower through obedience to his plan and his commandments. We have in his Son a perfect example of willing obedience and perfect love. How hopeless life would be without the absolute assurance of justice centered in fixed laws that are the bedrock foundation of the Father’s plan. What is true one day cannot be manipulated to be something else by the whim or command of another personage. Your happiness is absolutely guaranteed as you willingly obey his commandments, receive all of the necessary ordinances, and are obedient to them, for he is a perfect, loving Father who will never change. Somehow during that horrifying experience, I glimpsed how except for the Atonement of Jesus Christ, which lets us rectify mistakes through his plan of redemption, justice would demand a recompense for every error committed in life that we could not fulfill. Thus we could not return to Father in Heaven’s presence. We would be left under the dominion of Lucifer, whose intent is to capture us and to destroy everything that is good and righteous in our beings. Over time we would become like Satan because we would lose all hope of returning to Father in Heaven and of benefiting from his righteousness, his mercy, and his perfect love. Although I would not welcome another like experience, this dream has taught me how easy it is to take for granted our relationship with our Father in Heaven and his Beloved Son, our Master and Savior. Oh, how blessed are we that they are as they say they are, perfect in every possible capacity and attribute. Fundamental to their purpose is that you “might have joy” (2 Nephi 2:25). It is clear that no one who has an inclination to live the commandments of God would intentionally do things that would separate him or her from the Lord. I am confident you have the intention of doing all of the right things. Yet I wonder, are you doing them as fully and as completely as you are capable of doing? That is not an accusatory question. It is one asked in sincerity to help you, if needed, to open your eyes and evaluate each day’s decisions to confirm that what you are doing will lead you to where you most desire to be. Be certain that you are not being led “carefully” from the main track to happiness onto a sidetrack that can, in time, result in the loss of that which is most precious. What are some of the warning signals that are red flags indicating danger ahead? Do you think of others more than of yourself? If you are married, are you more understanding of your companion, more anxious to make life easier for that beloved being than for yourself? Do you seek time with your children or your parents in preference to a group of private friends? Have you received all the ordinances of the temple that you can receive—or is that something left for a future day? If so, that day may never come. Does the acquiring of things, when viewed in the brilliant light of reality, sometimes mean more to you than obeying principles known to be true? Do you thirst after righteousness? Or are there times when the allure of stimulating images is allowed to temporarily fill your mind because, after all, they are really not that bad? Do your actions focus on entertainment, immediate satisfaction, self-interests, or personal gratification even though your goals are elsewhere? Do you find yourself often thinking of all of the things that you wish you had that you’ve not been blessed to have—maybe even very desirable ones like a husband or wife or children, good health, more personal attractiveness, more joy and happiness and peace of mind—while neglecting to recognize all that the Lord has blessed you with already? Do you ever pray to him when your heart is so filled with things to thank him for that you do not feel inclined to ask for anything else? If you are one of the truly happy individuals who love your Father in Heaven and are grateful for each day’s blessings, reaching out to others in preference to thoughts of self, I rejoice for you. You have found a pattern of life that will ever bring you happiness. I can do little more than encourage you to continue to enjoy a life squarely centered in love of your Father in Heaven, your Savior, and those blessed to be within the circle of your righteous influence. If, however, you are among those who have not found a fullness of joy, even in your determination to live the commandments of the Lord, I pray that there could be something of worth in what we’ve talked about. I pray that you may feel how very much your Father in Heaven loves you and wants you to be happy. I pray that you will be stirred to recognize how infinitely blessed you are to have a Father in Heaven, to have a plan that is perfect, to be able to acquire a clear understanding of what brings happiness in life through pondering, prayer, and application of his teachings. I pray that you may grasp how comforting it is to have a fixed identity that can be counted on forever and to live in an environment where there is unchanging truth and justice tempered by mercy. May you be even more sensitive to the direction the Lord would give you in your personal life so that you may grow in understanding and perfection. In my dream there was no physical evidence that what my faith led me to do could be done. There was nothing to indicate in any way that what I so much desired could possibly happen. There was nothing that I could see or hear or touch to encourage me. On the contrary, all around me was like a confirmation that I would never see the Jeanene I so much love ever again. Now I recognize that it was my faith in our Father in Heaven and his perfect Son as well as in their holy plan of happiness that freed me from that devastating environment. Fortunately you do not have to live in a world where there is nothing to support you in your convictions. By the choices you make, you can surround yourself with individuals and influences that will constantly aid you in your determination to live the commandments of God. In so doing you will receive the fullness of blessings possible from his comprehensive plan of happiness conditioned to your specific needs. By choosing to continually participate in Church activities you constantly renew influences for good from others with like dreams and the determination to live righteous lives. As you serve others there comes a strengthening of your own capacities. There quietly distills upon you a confirmation that those principles that guide your life taken from the Lord’s commandments are true. Your selfless service to others in your home, in the Church, and in every other walk of life will help verify your confidence in the plan of the Lord. You will know that Satan can have no power over you except as permitted by fear, indolence, disobedience, and appetite. In contrast, everywhere about you there are individuals that embrace the appealing offerings of Satan as the only real way of life. They do not recognize and many even deny the existence of spiritual guidance or the reality of a loving Father in Heaven. They allow themselves to be convinced that what is really enduring is what they see, touch, smell, hear, and taste. In short, they confine themselves to the world Satan wants them to be confined in. They cut themselves off from the glorious opportunities that their holy Father in Heaven wants them to have. Don’t you make that mistake. One can center his or her life in falsehood as though it were truth and be increasingly bound by the arch enemy of God while being subtly led from eternal happiness. Such shaking comes through stirring challenges and stretching tests. You likely have encountered some already. You undoubtedly will encounter others. They may come in the form of an accident, the conferral of a great responsibility, or a move that dramatically changes your surroundings and circle of trusted friends. You may begin educational or professional pursuits that prove far more demanding than anticipated. Perhaps personal illness, handicaps, or the death of a loved one puts seeming barriers in your path. In truth they are more likely giant steps intended to lift you to higher levels of understanding and accomplishment. How these challenges are confronted is critically important to your happiness and personal growth now and forever. When armed with the power that an understanding and application of the teachings of the Lord provide—and with faith in him and in the capacity of the Holy Ghost to guide and fortify—you will overcome those challenges and gain the intended growth and attainment. As you remember that you are an eternal being, with latent capacities derived from divine parentage, you will not allow yourself to be limited by the confining world that Satan would have you believe is all that exists. How can you see with greater clarity and feel more intensely the help that is available beyond the veil of this physical world? I would remind you of six of the many sources of help. Establish a set of guiding principles for your life. You likely have done that. With such standards you will not make the wrong decisions on the basis of the circumstances and the pressures of the day. Principles that you are determined to live by will keep you on track. There is no better set than the teachings of Jesus Christ, his gospel, and the principles that flow from them. As you crystallize guiding principles for life, be honest with yourself and with the Lord. My experience is that most of the tragedy, disappointment, and lack of attainment in life comes when one is dishonest with himself or with the Lord. Then never compromise your principles, no matter how it seems that circumstance would allow some departure from them. Don’t do it. Rationalization—to take something that is true and try to twist it to justify invalid exceptions—is Satan’s tool to lead you from truth. Difficulties in life start when small deviations from your standards are justified on the basis of circumstance. Don’t let that occur. Strength comes from making no exceptions to your principles. Individuals who live for the moment, who make decisions on the basis of current circumstances or what someone else would lead them to do, eventually are doomed to violate eternal law and to lose the great opportunities of life. They may temporarily leap ahead in a particular aspect of life, but they lose those things that bring happiness in the overall purpose of life. When you center your life in truth, you are assured success and happiness. The scriptures are an excellent source of understanding and strength. When carefully read, pondered, and the truths revealed applied diligently, they are an important source of worthy motivation and strength. They fortify faith in truth. As you read the scriptures with faith in the Redeemer and confidence and trust in the plan of salvation, you will receive great strength. Your courage to do what you know is right will be enhanced. You will be fortified in the necessary discipline in your life essential to consistent obedience to the teachings of the Lord and continually adherence to the most important priorities of life. The scriptures give eloquent confirmation of how truth, consistently lived, opens the door to inspiration to know what to do and where you are needed to have your capacities enhanced by divine power. As you reflect upon the examples of how others’ capacities to conquer difficulty, doubt, and seemingly insurmountable challenges were strengthened by the Lord in time of need, there will come a quiet confirmation through the Holy Spirit that their experiences are true. You will know that similar help is available to you on the conditions prescribed by the Lord. Another most significant way to enhance your capacity to understand and live eternal truth is through temple worship. Only by receiving the fullness of temple ordinances and living the covenants made there can you enter into the highest degree of glory and receive the greatest measure of happiness eternally. Temple attendance has a calming, settling, consoling influence that distills peace and contentment. The accompanying family history work to identify ancestors to receive those ordinances yields similar blessings. My faith began to be unshaken in the Lord; and I prayed unto him with many long strugglings for my brethren, the Lamanites. All that I have said is true. May it help you. Yet there will ever be a need for you to walk to the edge of the light of the knowledge and testimony you possess into the twilight area of faith. You will be asked to exercise faith in truths you have not yet come to prove through your own experience or through the sacred witness of the Holy Ghost. Exercise faith. Faith is abiding trust in truth. Faith leads one to action, to achieve goals even when there is little visible evidence to give hope of success. It is a source of power to know simple yet profoundly important, priceless truths and to have the faith to live them. Enduring happiness is rooted in unchangeable truth. Good music, especially sacred music, makes spiritual things more understandable. It is edifying and conducive to understanding. It prepares emotions for response to promptings of the Holy Spirit. My prayer is that you may be helped in every way to live your life in the world of reality—the Lord’s reality founded on his eternal truth, his plan of happiness—so that you will not be captured by the artificial environment that Satan would try to make you believe is all that exists. The environment of your Heavenly Father leads to celestial happiness. The environment of Satan leads to anguish, hatred, and enduring misery. Your goals are noble, but you decide by the choices you make each day whether they will be realized or not. A knowledge of truth is of little value unless lived in full measure. If you think it is too hard, that you are imperfect and will not be able to do it, you are slipping into Satan’s world. Garner strength by remembering that you can do anything the Lord asks you to do. When needed, he will see that you get the required help as you do all you are capable of doing. It is the intent of our Father in Heaven to take you from your current state of progression to the highest levels of attainment in celestial worlds. You don’t know how he can do it, yet by meeting each test you demonstrate your faith in the Savior and in the plan of your holy Father. Though you do not see the end from the beginning, your trust in them will give you the capacity to overcome. It is a principle of happiness to work hard and to obey willingly the principles of truth, confident that the Lord will open doors of help when needed. Our Father in Heaven will not violate his plan. He will not give eternal blessings to those who want them but have not paid the price in repentance (when needed) and consistent obedience. All of the richest blessings Father in Heaven has in store are within the reach of every individual who submits to the will of the Father and consistently lives his commandments and receives all of the ordinances and covenants he is able to have in this life. This dream helped me understand as never before what hopeless means. How grateful I am that in the Savior there is absolute surety of eternal life when we pay the price of obedience and receive the necessary ordinances and keep the covenants made therein. Our faith in justice and in mercy and in Jesus Christ and our confidence in the perfect Father lay a foundation for happiness in this life and provide assurance of eternal happiness. Although I have with significant effort tried to make as clear to you as my dream did to me the difference between Satan’s plan of entrapment and our Father’s plan of happiness, I do not feel that I have succeeded. I therefore pray that as you ponder the things we have discussed that the Holy Ghost will bear witness to you of the truths I have tried to emphasize. For our time together to have enduring benefit, you need to do something with the insights shared. You may already have begun. Make the commitments you are impressed to make with the Lord and keep them. All of what we have discussed is true because you have a Father in Heaven who loves you very much and wants your eternal happiness and also because you have a Savior and Redeemer. He willingly took upon himself the consequences of all the transgressions of the Father’s children that have been or ever will be committed. As Jehovah he understood what his Father asked him to do, as only a god could. Yet it was through this experience and those that followed—culminating in his giving of his life, being laid in the tomb, and his glorious resurrection—that he earned the right to judge each of Father in Heaven’s children according to how they use this time of probation here on earth. Although he committed absolutely no transgression, he allowed the consequences of all others’ transgressions to come upon him and thereby learned what, as a Savior, he needed to know and feel. We cannot comprehend, we cannot appreciate adequately the price he paid nor what this selfless, sinless, perfect being has done for us in total obedience to his Father’s will. I solemnly witness that God our Father lives, that his plan is perfect. I bear testimony that as you raise your voice in prayer, those prayers are heard and can best be answered when they come from a broken heart and a contrite spirit. I know that someday I will be judged on how well I testified of my certain knowledge of Jesus Christ. 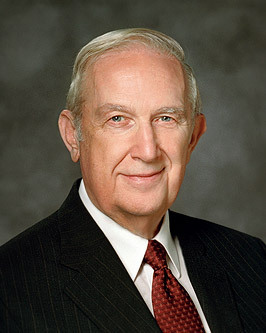 Therefore I solemnly witness that because of the Atonement of the Savior, the plan of happiness will succeed and Satan’s plan is doomed to failure. I know that Jesus Christ lives. I solemnly witness with every capacity that I possess that he lives and that he loves you and will help you find happiness. I say this in the name of Jesus Christ. Amen.